who had moved from London to Coventry. Alice was a dressmaker. Their first daughter Ruby Alice Musgrove was born on twenty second of February 1911 and registered on the first of April 1911. 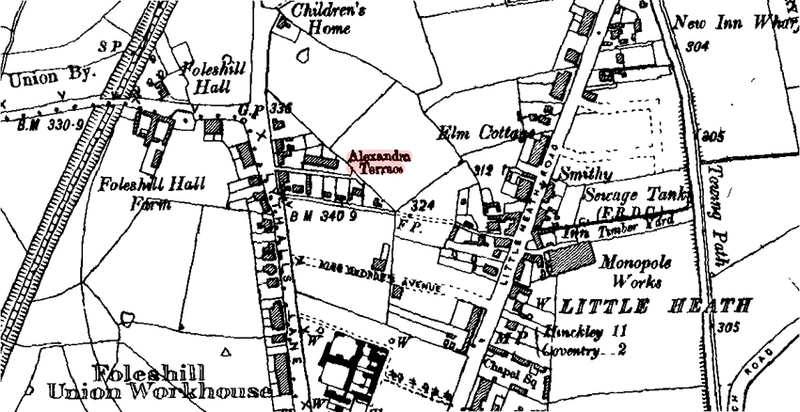 The map below dates from 1914 and show the immediate area around where they lived at Little Heath Foleshill. We have highlighted Alexandra Terrace in Red. Note other places of interest nearby ie. The Union Workhouse, The Canal etc.